Diabetes is a higher level of glucose in the blood than is normal. Glucose travels through the body in the blood. A hormone called insulin then helps glucose move from the blood to the cells. Once glucose is in the cells it can be used for energy. A problem making or using insulin means glucose cannot move into cells. Insulin also helps glucose to move into the liver for storage if there is too much to use. Without enough insulin, glucose will build up in the blood. In type 1 diabetes, the body does not make insulin. This will lead to the build up of glucose in the blood, also called hyperglycemia. At the same time, cells are not getting glucose they need to function well. Over a long period of time high blood glucose levels can also damage vital organs. The blood vessels, heart, kidneys, eyes, and nerves are most commonly affected organs. Type 1 diabetes is often found during childhood and young adulthood. Our immune system keeps us well by fighting off and destroying viruses and bacteria. Unfortunately, sometimes the immune system attacks healthy tissue. Most type 1 diabetes develop because the immune system attacks and destroys the cells that make insulin. These cells are in the pancreas. It is not yet clear why the immune system attacks these cells. It is believed that some people have genes that make them prone to getting diabetes. 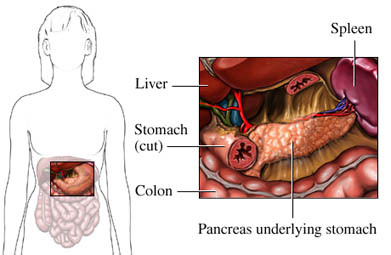 For these people, certain triggers in the environment may make the immune system attack the pancreas. The triggers are not known but may be certain viruses, foods, or chemicals. You may also need other blood tests, including. Diabetes treatment goal is to maintain blood sugar at levels as close to normal as possible. Regular medical care is important for preventing or delaying complications. While diabetes makes blood glucose levels too high, treatment can make blood glucose levels go too low. This is called hypoglycemia. It can cause confusion, shakiness, anxiety, heart palpitations and more. If the levels fall too low it can cause seizures and loss of consciousness. Medication and diet will be adjusted to prevent hyperglycemia and keep the risk of hypoglycemia low. Insulin injections replace the insulin that is missing. The amount given is based on individual need and a blood glucose test that is taken before and after meals and at bedtime. Insulin shots will be needed 2 or more times daily. There is one short-acting inhaled insulin which may be available for select persons. An insulin pump can automatically deliver small amounts of insulin through the day. Insulin may be available in inhaled forms. Amylin is made in the pancreas along with insulin. In people with type 1 diabetes, this hormone, like insulin, is missing. The missing amylin may be responsible for the blood glucose rise after a meal in people with diabetes. The drug pramlintide may be used in adults when insulin therapy is not enough to control blood sugar. Glucagon can be injected to quickly increase blood glucose level. People with type 1 diabetes should always have an emergency supply available in case of hypoglycemia. A medical alert ID can let others know of the condition if communication is impacted. If not controlled by diet and exercise, medications may be needed to control blood pressure and cholesterol . Vaccinations will be needed. Some may be needed earlier in children with diabetes. Follow a well-balanced meal plan with a variety of food groups. Avoid highly refined carbohydrates. This includes sugar or high fructose products like soda. Exercise is encouraged as long as blood glucose levels are under control. The doctor will advise activity levels and changes that may need to be made. The insulin dose or diet may need to be adjusted if glucose levels are low after exercise. Regular blood glucose checks throughout the day will help manage diabetes. Testing is often done with a blood glucose monitor. Continuous monitoring systems that are worn all day are also available. Keep a record of the results to show the doctor. The treatment plan may change based on test results. The HbA1c blood test is also used by the doctor to assess overall glucose control. This is a procedure that is still being investigated. It involves transplanting islet cells from a donor to a person with type 1 diabetes. After the transplant, these new cells are able to produce insulin. In some cases, people who receive these transplants may no longer need insulin injections. This device is still being studied and developed. It is a continuous glucose monitoring system (CGMS). This system can automatically checks glucose levels through the day. Insulin is then delivered as needed through the day and night. The monitoring system will help keep blood sugar levels within the normal range without daily testing or injections. Depression can undermine recovery and increase the risk of other complications. Feelings of sadness, hopelessness, and loss of interest in activities that last for at least 2 weeks should prompt a call to the doctor. Depression is treatable. Counseling can help better manage depression and diabetes. Practice good footcare. Be on the lookout for any sores or irritated areas. Keep the feet dry and clean. Keep track of moods and be alert for persistent depressive symptoms. There are no current guidelines to prevent type 1 diabetes. Some research is looking at the effectiveness of suppressing the immune system. This may be helpful in people who are at high risk of developing type 1 diabetes. Type 1 Diabetes. National Institute of Diabetes and Digestive and Kidney Diseases website. Available at: https://www.niddk.nih.gov/health-information/diabetes/overview/what-is-diabetes/type-1-diabetes. Updated July 2017. Accessed August 25, 2017. Diabetes. Centers for Disease Control and Prevention website. Available at: http://www.cdc.gov/diabetes/home/index.html. Updated July 23, 2017. Accessed August 25, 2017. Diabetes type 1. EBSCO DynaMed Plus website. Available at: http://www.dynamed.com/topics/dmp~AN~T116244/Diabetes-mellitus-type-1 . Updated August 29, 2016. Accessed August 25, 2017. Type 1 diabetes. American Diabetes Association website. Available at: http://www.diabetes.org/diabetes-basics/type-1/?loc=DropDownDB-type1. Accessed September 19, 2017. 9/23/2008 DynaMed Plus Systematic Literature Surveillance http://www.dynamed.com/topics/dmp~AN~T116244/Diabetes-mellitus-type-1 : The Juvenile Diabetes Research Foundation Continuous Glucose Monitoring Study Group. Continuous glucose monitoring and intensive treatment of type 1 diabetes. N Engl J Med. 2008;359(14):1464-1476. 3/12/2010 DynaMed Plus Systematic Literature Surveillance http://www.dynamed.com/topics/dmp~AN~T116244/Diabetes-mellitus-type-1 : Cardwell CR, Stene LC, Joner G, et al. Birthweight and the risk of childhood-onset type 1 diabetes: a meta-analysis of observational studies using individual patient data. Diabetologia. 2010;53(4):641-651. 4/1/2011 DynaMed Plus Systematic Literature Surveillance http://www.dynamed.com/topics/dmp~AN~T116244/Diabetes-mellitus-type-1 : Verbeeten KC, Elks CE, Daneman D, Ong KK. Association between childhood obesity and subsequent Type 1 diabetes: a systematic review and meta-analysis. Diabet Med. 2011;28(1):10-18. 9/11/2014 DynaMed Plus Systematic Literature Surveillance http://www.dynamed.com/topics/dmp~AN~T116244/Diabetes-mellitus-type-1 : Tovote KA, Fleer J, et al. Individual mindfulness-based cognitive therapy and cognitive behavior therapy for treating depressive symptoms in patients with diabetes: results of a randomized controlled trial. Diabetes Care. 2014;37(9):2427-2434.